Officially kicked off my summer peakbagging endeavors on this Memorial Day weekend. North Cascades Highway reopened two weekends ago, so I wanted to climb something up north. Since forest service site didn’t have the most up-to-date info on road conditions, I took a shot in the dark with McLeod and hoped for the best. Some big rocks along a few sections of Road 5200, but passable if negotiated with caution. And with major road repairs done in recent years, I was able to drive (very carefully) on the rough Long Creek Road (NF-500), to the 4,900′ road bend right before the washout by Long Creek. Pup and I crossed the creek on the road and scrambled up the northwest-trending ridge. Snow appeared at 6,400′ as the ridge took a turn due north, where we had a nice view of Midday Peak (Peak 7670) on our left. 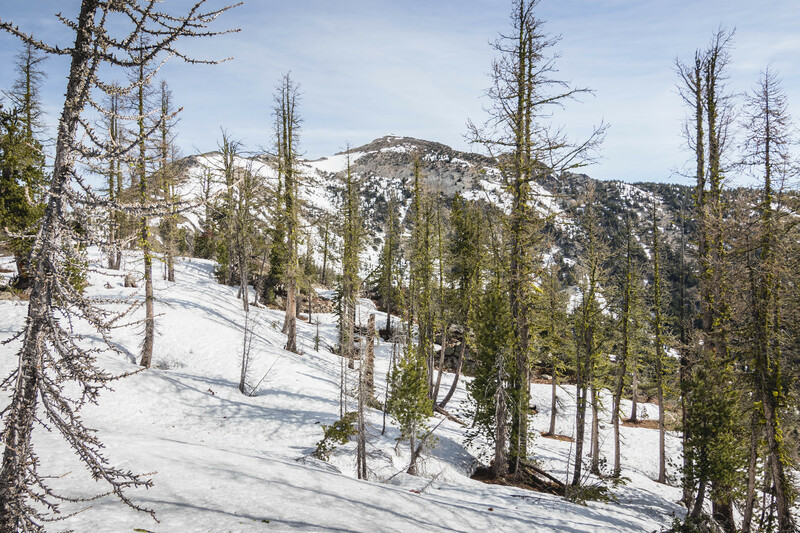 At 7,200′ I put on snowshoes and continued north until steep terrain flattened at 7,800′. I left the snowshoes here since snow coverage was spotty along the ridge. Last 200′ scramble was on easy terrain over scree and snow patches. What a gorgeous day for this season opener. To the north, boundless views reached far beyond the border. Residual snow in higher elevations copiously accentuated the undulating ridges all around us. 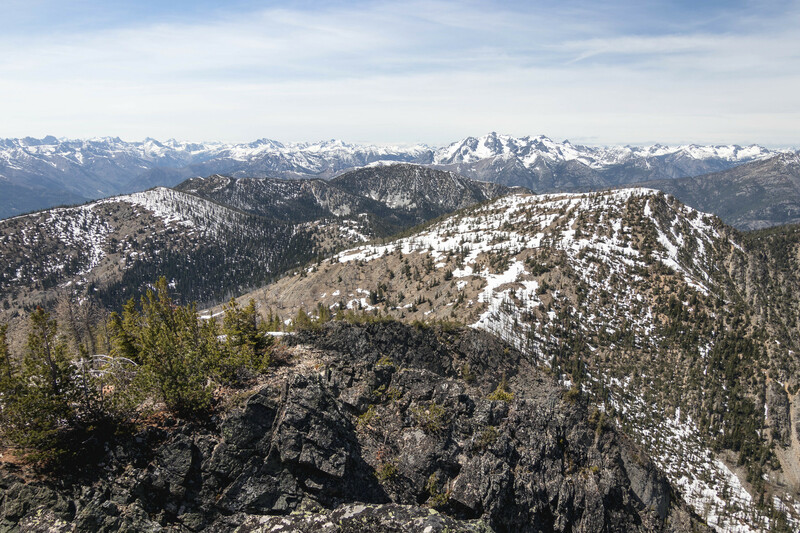 Many familiar high points west of Lost River–Robinson Mountain, Lago Slam, Monumental Slam, Ptarmigan Peak, those to the south in the Methow Valley, as well as Craggy Slam peaks just north of here. Feeling energized by the good weather, abundant remaining daylight, and inspiration from several trip reports, I decided to run the ridge to Setting Sun Mountain. We reversed our route back down to the saddle with Midday Peak, then snowshoed up the northeast ridge to the summit. A quick survey of all nearby peaks and we continued on to Afternoon Mountain via the west ridge. This summit offered a slightly different perspective of the scenery as it’s right next door to Midday Peak. Setting Sun Mountain still looked pretty far away. Descending the southwest ridge, we got around the high point north of Peachy Peak to its south saddle. Then we followed the north ridge up to the summit. More snow coverage would’ve been nice to make snowshoeing more straightforward. Another quick stay before the final ridge traverse to Setting Sun Mountain, which felt long and slow. Moving west on the ridge, I left the snowshoes by Point 6983 as the snow looked skimpy for the rest of the traverse to Point 7125. Lots of recent work had been done along the ridge to clean up down trees. After negotiating Point 7125 from its north, the ridge turned north-northwestward. Most of the traverse was on or west of the crest. After slowly getting up the last 400′ from the south saddle, we were both pretty pooped. Judging by the foundation and the metal bars, there used to be a lookout site on this summit. Great views in the afternoon light, still couldn’t believe we had come all the way from McLeod. We spent some time on this summit since it was our last; I got carried away with taking photos and didn’t get the nap I wanted. On the way down, we followed our route back to Peachy Peak, but bypassed the peak at 7,000′ and traversed to its south ridge. Evidently more work had also been done on this ridge to clear out the massive down trees. 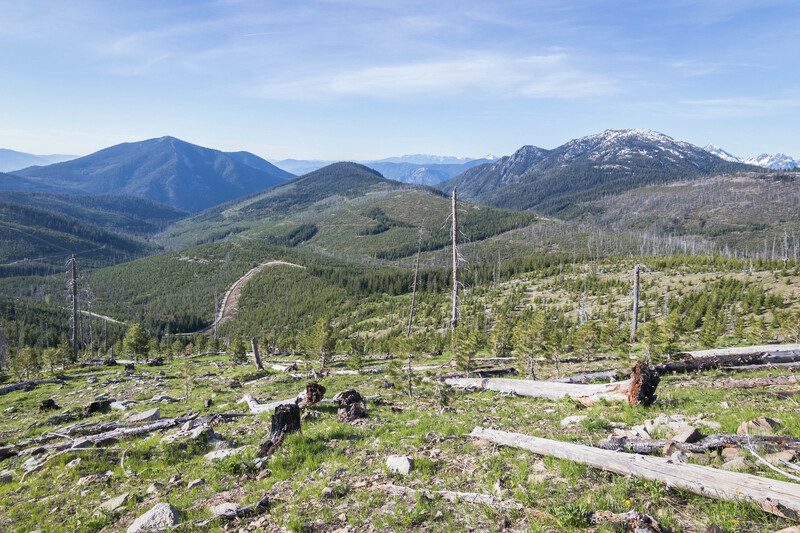 At 6,400′ we cut the down tree-infested east slopes down to Road 560, which apparently was also part of Long Creek Road. Many berms here to keep out motorized vehicles. We arrived at the 5,300′ junction about one mile later, then we stayed on Long Creek Road and hiked two miles back to the car.